Working with arts professionals, a geographical and conceptual city-wide strategy has been developed to guide commissioning of art in the public domain in relation to Glasgow’s tenure as host city of the Commonwealth Games in 2014. Working closely with engineers, design studies have been developed for various sites where water management is a big issue, using SUDS creatively as the principle driver of the layout and to create biodiverse public space. Working with several local authorities and key stakeholders, a co-ordinated open-space network plan has been developed to connect and open up the large swathe of wetlands between Gartcosh and Gartloch. 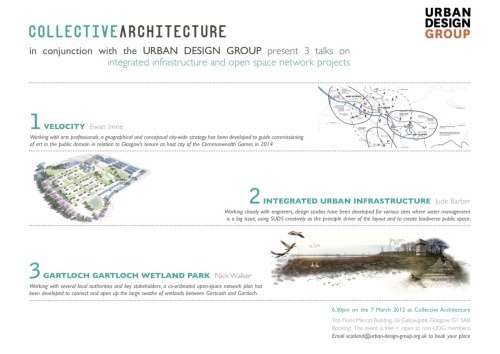 This is event is a collaboration between UDG Scotland and Collective Architecture.